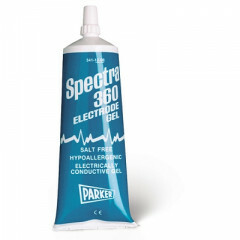 Spectra Gel conductive electrode gel provides increased stimulation during e-stim play. Spectra Gel conductive electrode gel provides increased conductivity between e-stim electrode attachments and tens pads for greater stimulation and effectiveness. As a result it will help you get the most power and kick out of your electro stimulation toys, attachments and Tens Units. It will also help extend the life of Tens pads and increase effectiveness on hairy areas where good contact and transfer are a challenge. Increases effectiveness and stimulation when using E-stim gear. Useful for: Increasing conductive transfer and stimulation when using e-stim accessories and tens units. If you are having trouble getting your electro stimulation accessories to make good solid contact then we recommend trying Spectra Gel. It is a medical gel that is specifically made to increase transfer in Tens Unit and monitoring pads. It can help extend the life of Tens pads that are near the end of their life, too. It is inexpensive and very effective. So, if you aren‚Äôt quite getting the experience you expected or are getting erratic stimulation we highly recommend it. Most issues with e-stim are the result of poor contact. To remove Spectra Gel just wash area and attachments with warm water and a small amount of soap. Note do not attempt to wash or clean Tens pads and do not soak your PES attachments.